Rad said: I found the G-Project G-Go to be just fine for use in the shower. Its sturdy design meant that I could pick it up by its built-in handle and take it just about anywhere. The fact that the G-Go uses only nonrechargeable batteries will be a drawback to some, but it can be plugged into any wall outlet. And I appreciated the inclusion of basic Play/Pause and Skip Forward/Back buttons. 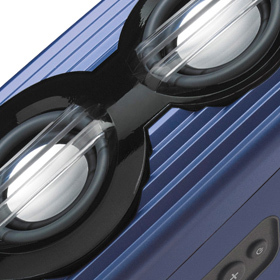 The G-Go has plenty of volume and plays loud without excessive distortion. The only bad news is its warranty: a mere 90 days. The gist: Cool form factor for this portable.